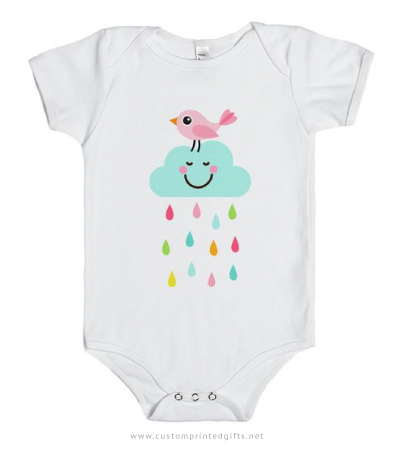 Baby one-piece featuring a pink bird standing on a happy little cloud with colourful raindrops. Cute cartoon design for baby girls. A selection of unique, custom printed gifts from Skreened and Zazzle. Many products can be customized with your own text, for example a name. Create your own custom printed gear at Zazzle! Upload your own images for truly unique gifts!